Motorists travelling between Peterborough and Whittlesey this morning faced long delays due to roadworks on the A605. Cambridgeshire County Council began five day preparation work as part of the design phase for the Kings Dyke level crossing closure project. 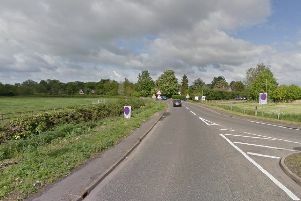 However, with North Bank still closed due to flooding the council said there were delays of up to 25 minutes for motorists, although some Peterborough Telegrapgh readers reported a travel time of up to 90 minutes between Whittlesey and Stanground. As a result, Cambridgeshire County Council has this morning, Monday April 9, taken the decision to stop works and the closed lane will shortly be reopened. The council did say last week that "If Northbank Road is closed because of flooding then the works will be postponed." Last week the council briefed residents on why the work was taking place. A spokeswoman said: "The five day preparation work involves digging holes to record the exact locations and depths of any underground pipes or cables, to find out if they need diverting or protecting before the construction phase of the project begins. The holes will then be refilled before the end of each working day. "One of the traffic lanes will be closed for a short section of the A605 - from a point west of the Funtham’s Lane junction to east of the level crossing. The lane closure will be in place from Monday 9 to Friday 13 April between the off peak hours of 9.30am and 3.30pm. The road will be fully open to traffic outside of these hours. "Temporary traffic signals will be in place on either side of the railway crossing to ensure drivers, cyclists and pedestrians can pass the work safely and keep the level crossing clear at all times. "The signals will be managed to prevent traffic stopping on the crossing and protect the road users and workforce. Delays are to be expected on top of those caused by the crossing itself."